The 1946-1947 Yearbook of the United Nations provides a detailed overview of the events. A procedural history is available in the UN Audiovisual Library of International Law. The 70 Years, 70 documents exhibit provides additional information. Between the adoption of the Charter and the beginning of the functioning of the United Nations, the Preparatory Commission and its subsidiaries worked on many practical matters and made recommendations to the UN organs. Key texts were published in United Nations Documents, 1941-1945, published by the Royal Institute of International Affairs, 1946. Collection of key texts related to the origins of the United Nations, including outcome documents of: St. James's Palace Meeting, Atlantic Charter, Moscow Conference, UNRRA Constitution, Tehran Conference, Cairo Conference, Bretton Woods Conference, Dumbarton Oaks Conversations, Crimea Conference, San Francisco Conference. Digital version available in the Internet Archive, accessed 19 Jan. 2015. Online exhibit prepared for the 70th anniversary of the founding of the UN, with links to key UN resources related to the events leading to the establishment of the United Nations. The 1946-1947 Yearbook of the United Nations has a detailed history of the negotiations leading up to the adoption of the Charter. The United Nations Conference on International Organization, was held in San Francisco, California, 25 April - 26 June 1945, to draft the Charter of the United Nations and the Statute of the International Court of Justice. The text was based on earlier proposals, negotiated in various subsidiary bodies, and finally adopted unanimously in a plenary meeting of the Conference on 25 June 1945. Representatives of 50 countries participated in the San Francisco Conference. The Charter was opened for signature on 26 June 1945. The representatives of 50 countries signed on 26 June; Poland signed on 15 October 1945. 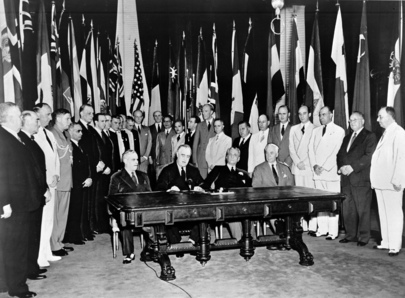 In accordance with Article 110, the Charter entered into force on 24 October 1945, after ratification by the five permanent members of the Security Council and a majority of the other countries. Twenty-two countries subsequently deposited their instruments of ratification. This is the complete documentary "legislative history" of United Nations Conference on International Organization, which was held in San Francisco in 1945. The collection of documents was originally made available as follows: volumes 1-15 were published by the United Nations Organization in cooperation with the Library of Congress. A sixteenth volume was added in 1946 which indexes the first fifteen volumes. The collection was completed with volumes seventeen through twenty-two, the bilingual, supplemental volumes & indexes published in 1954 by the Secretary-General of the United Nations. Volumes 16, 21 & 22 are indexes. Subscription database with the digitized version of the San Francisco Conference documents. Available at UNHQ in New York and other institutional subscribers. Search results in the WorldCat database for libraries that hold this multi-volume set. A list of the founding Member States of the United Nations with information about the date of signature and ratification of the Charter. Search in Dag Hammarskjöld Library's online catalogue for materials about the San Francisco Conference. Film and audio from the collections of the Audiovisual Libraries of the UN. 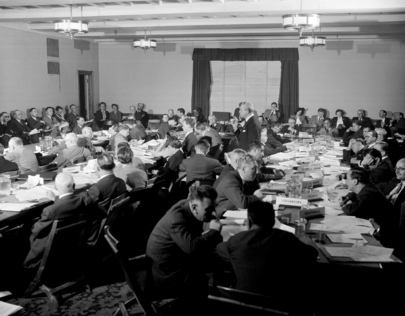 The Preparatory Commission of the United Nations was established by the San Francisco Conference on 25 June 1945 through the adoption of the "Interim Arrangements Concluded by the Governments Represented at the United Nations Conference on International Organization". was established "for the purpose of making provisional arrangements for the first sessions of the General Assembly, the Security Council, the Economic and Social Council, and the Trusteeship Council, for the establishment of the Secretariat, and for the convening of the International Court of Justice"
consisted of "one representative from each government signatory to the Charter"
Document establishing the Preparatory Commission of the United Nations. From, Documents of the United Nations Conference on International Organizations, vol. 15, p. 512-513.